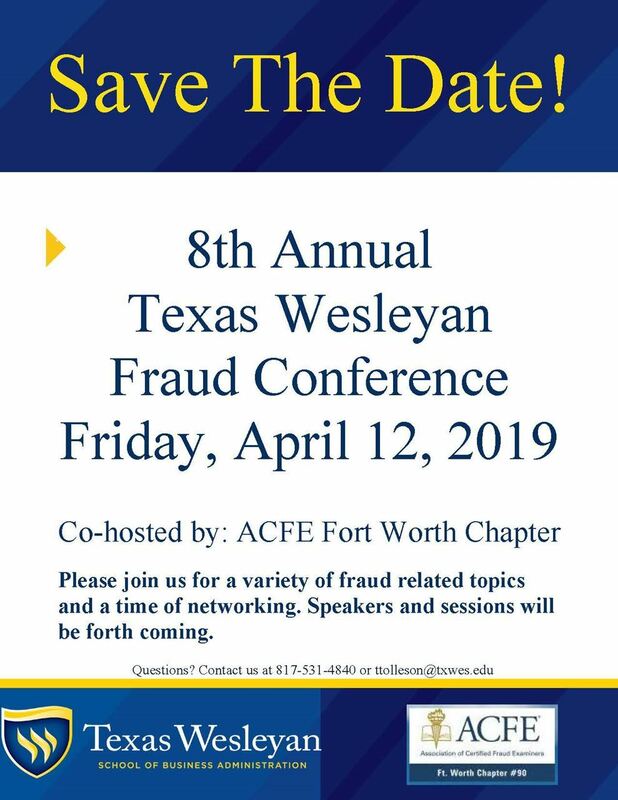 The 8th Annual Texas Wesleyan Fraud Conference, co-hosted by the Fort Worth ACFE Chapter, will be on held Friday, April 12, 2019. The full-day conference offers 9 hours of CPE credit. We are still accepting sponsors for this annual event. If you would like to be a sponsor at the 8th Annual Texas Wesleyan Fraud Conference, please contact Dr. Tom Tolleson at 817-531-4840. Individuals who "no show" at the conference will forfeit the entire registration fee. Substitutions are welcome. Parking is free to conference participants. Handicap parking and access are provided. Please silence all cellular phones while the conference is in session. All audio and video recording devices are prohibited at the conference without prior written permission from Texas Wesleyan University. Texas Wesleyan University is a tobacco-free campus.